Our economic and environmentally friendly system of tree and brush mulching has a low ground pressure and site disturbance approach. By using this land mulching procedure we can reduce the need for trucking out waste by turning the mulch into topsoil. Our land clearing services do not involve any brush burning, enabling us to work anywhere from urban residential to rural areas, with year round availability. Land clearing can involve anything from removing unwanted brush, to stump removal, to rock breaking, to mulching entire trees. 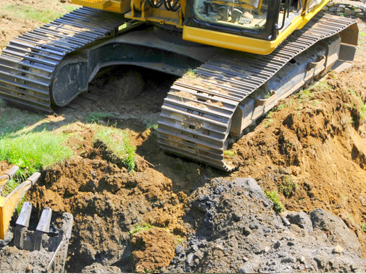 Excavation can involve anything from land grading, to installing culverts, to building utility trenches, to gravel road construction and maintenance. Our services are ideal for both recreational land development, and lot clearing for real estate.